While giving the last few NHL games a little play thanks to EA Access ten-hour trial they have on every new release, no way am I going to sit here and say that NHL 18 has now become a massive part of my life. While being enjoyable, I'd still say that of course, the fans of the sport will get way more out of this over guys like myself who crave for the games of yesteryear. That said, I've found NHL 18 really easy to get to grips with controls and the rules, but no way do I class myself as still having a clue why a sport allows another person to shoot a puck at the face at someone in a tiny goal;. Clearly, that position is made for someone with a deathwish. 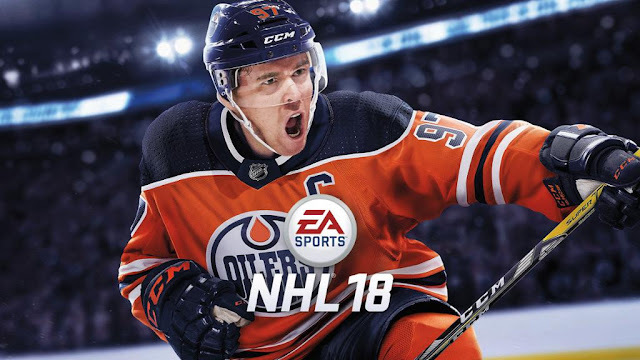 The game has a bunch of modes such as Franchise mode (control everything from the team to seat prices), Be a pro, Season Mode, Hockey Ultimate team, Draft Champions, and all the modes you can think of if you're fan of previous EA sports games currently out there. I will say this, as a none hockey guy, certainly some of the modes were lost on me when it comes to things like drafts and modes centred around building teams of good players, but I guess that's more me not knowing much about the sport. Threes mode for me, like I said at the start of the review, was the reason I came into this. Offering a less serious side of the sport, as you play a 3v3 match with certain rules now being part of each match. The mode offers you three modes to play the game. Circuit being the career mode with you going around city to city playing against teams to unlock items such as jerseys, arenas, heroes, and easily the best part of the mode, mascots to use as players. The games themselves are decided at the start of the match, either offline or online co-op, with each game having a coin flip with the winner deciding what the game rules will be, as well as choosing if you want the money puck involved. Games can be won by a set amount of goals needing to be scored, or the average way of play with just periods of a certain length having to be played out, winner being the one with the most goals at the end. The money puck is the game changer here if you choose to allow it in games, with this puck either adding to your score or taking away. Score with a puck and get two goals rather than one can be one such moneypuck. Another moneypuck can see goals being taken away from the other team when scoring with it too. It can flip a game at any moment, but can also bring fits of rage if you are on the end of one. The other two modes are a simple exhibition match or online in which you can face friends or randoms. In terms of how much fun the game is to play on the rink, I can't really fault it in all honesty, both in the more serious sim style games and the more arcade modes of things such as Threes. Much like FIFA and Madden, NHL games have already reached the height of being closer to the actual sport that it doesn't really have to do anything on the field of play to improve it, nor can it do or fix anything to make it feel or play any better. Overall: It's been nice to dip into an NHL game once again, but that's all it was, a dip. As time has gone on I've begun to load up Threes less and less, with the more heavy side of the game not being something that I can find myself playing now the review is up. Sure, the hockey guys will mop up and love everything that NHL 18 has to offer, but guys like myself don't have a real reason to pick this up at full price. Certainly give the EA Access trial though. If not anything but to give Threes a blast.